Consider the pedagogical opportunities that help students succeed in band and orchestra. Good teaching skills, of course, are paramount. The music teacher is the first and foremost influence for students to stay or quit, but there are others as well. These are usually categorized into general reasons such as “loss of interest” or it was “too difficult.” We’ve heard more specifically from many students, “my instrument is too heavy or too awkward.” “It’s not fun.” “My instrument looks like junk.” Individually, these comments don’t mean too much, but collectively, they speak volumes. Manufacturers have heard these reasons enough times that they have spent much time and money on developing options that aren’t as heavy or as awkward. Woodwind suppliers have tried to help with curved headjoint flutes and kept C foot flutes for beginners because of their lighter weight. Beginner clarinets now have neck strap rings, lighter plastic models, and have even suggested that saxophonists start on clarinet. Brass makers have created 3/4 size baritones and tubas. Of course, fractional size violins have been around for decades. What’s obviously missing? Trumpet and trombones. No one starts on a piccolo trumpet. Some try cornet, but it’s not that different. A few have tried to start smaller students on alto trombone, but there’s no band literature available, and alto trombones are expensive. Perhaps you’ve never thought of this as a problem. But perhaps, also, you’ve seen students with “STS” -Sagging Trumpet Syndrome. Maybe you’ve seen trombone students holding their instrument precariously as they reach for 7th, 6th or even 5th positions. Weight and balance are huge issues for smaller players. Seriously, don’t you want them to focus on tone and technique instead of weight lifting and slide catching? The solution, of course, is trumpets and trombones designed by experts that sound very good, with all the proper features at less than half the weight. If that sounds appealing to you, consider Tromba instruments. These precision made trumpets feature stainless steel valves and with brass casing sleeves. Tromba trombones work well both with and without proper lubrication. Both feature the unique “TrueNote” leadpipe system. Tromba instruments are about 1/3rd the weight of comparable models. And, yes, they are made with extremely robust and sturdy ABS material – plastic! Unfortunately, some plastic instruments are not that good – and some thought you would enjoy multiple colors in your school band. But, truth be told, if early instrument makers had access to modern ABS plastic materials, plastic instruments would not be a big deal. Response is less a function of material and more one of design, nodal points and brace placement, as brass instrument designers will readily admit. Perhaps most importantly is that, while your students will likely progress more quickly, your audience probably won’t notice the difference. Except, of course, that the Tromba instruments will be dent-free and newer looking that most brass student instruments fresh from the factory! With models in high gloss gold and silver, both your audience and festival judges will be amazed! Perhaps it’s time to try a Tromba. It easy to buy one and they cost well under $200. At that price you can eliminate any parent objection about the high cost of brass instruments. You can also consider how to expand the music program at your Title One school. All of a sudden, a Tromba trumpet choir sounds like a great idea. 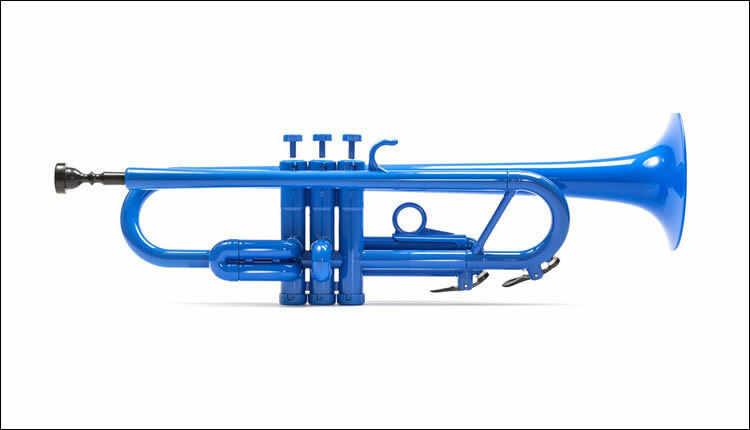 To contact a Tromba representative or order a sample instrument, visit www.trombainstruments.com.